Christophe Marane is a Breton publican and the innkeeper at the Brina Cross Inn. He sells food, rents beds, and provides advanced training in Blunt. During the recommendation quest, you’ll have to investigate a series of deadly assaults on traveling merchants along the Gold Road, and all clues lead to the inn. Christophe offers his services all day long, except when he sleeps in the downstairs area of the Inn between 2am and 6am. When approached, he will always greet you with the words: "Welcome to the Brina Cross Inn. Can I interest you in something to eat, or perhaps a bed for the night?" He wears middle-class attire: doeskin shoes, a quilted doublet, and a pair of tan linens. He wields a steel mace and carries a small amount of gold. 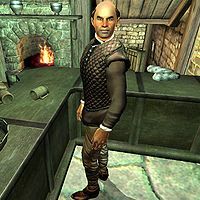 During the quest, you will have to book a room at the inn, and the always service-minded and small-talking Christophe will, upon his usual greeting, inadvertently provide another regular with some useful information: "Let me guess, traveling on business? You don't look like you’re out for a stroll. Ah, yes. Thought so. We get many of them traveling through here. Well, we used to. Haven’t seen as many lately, what with the… well, you know. The murders. I don't like to talk about it much, as it's bad for business. At any rate, would you care for a bed for the night?" Esta página foi modificada pela última vez à(s) 01h35min de 29 de maio de 2012.